Mary Karr nods to structure & obsesses over honesty in events, perspective, persona. She sees inner conflict as a story’s driver. 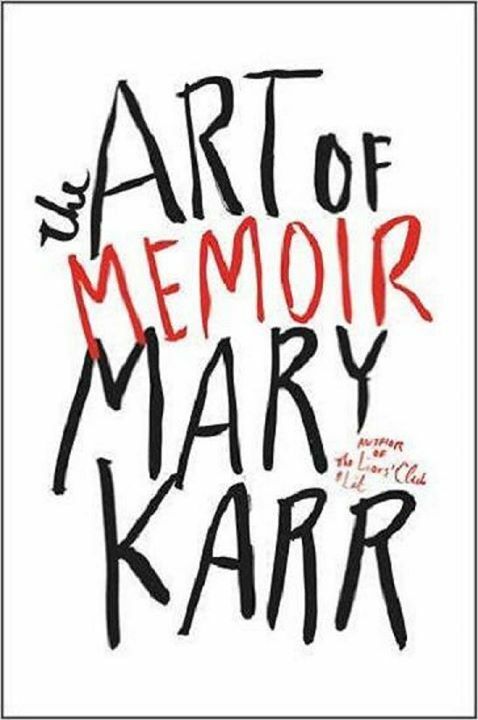 The Art of Memoir by Mary Karr. Harper, 229 pp. In terms of basic book shape, I’ve used the same approach in all three of mine: I start with a flash forward that shows what’s at stake emotionally for me over the course of the book, then tell the story in straightforward linear time. Usually the big story seems simple: They were assholes. I was a saint. If you look at it ruthlessly, you may find the story was more like: I richly provoked them, and they became assholes; or, They were mostly assholes, but could be a lot of fun to be with; or, They were so sick and sad, they couldn’t help being assholes, the poor bastards; or, We took turns being assholes. Each great memoir lives or dies based 100 percent on voice. . . . The goal of a voice is to speak not with objective authority but with subjective curiosity. Maybe that sounds easy. Just talk; be yourself. Karr tells how she broke the delete key on her computer and discarded 1,200 finished pages of her last memoir, the bestseller Lit (reviewed). All this because she couldn’t get right the perspective—and thus the portrayal—of her ex-husband (who refused to read drafts). In despair, she dreamed of him and herself when they were young and in love, and the key turned. She makes a powerful point here beyond the sturdy advice of employing a “dual persona”—presenting the perspective of you “now” and you “then.” Look, Karr says, the “now” you writing the story can forget without even realizing it who the “then” you actually was. How she loved, feared, yearned. This embodies the mysterious nature of memory, upon which memoir (and much of adult life) rests. Karr admits to another fault that seems as intrinsic to writing. Which is wanting to seem somehow elevated—maybe smarter, classier, more artistic or virtuous than you feel or actually live. Now, she’s a celebrated poet and memoirist, a literary arts high priestess; but she’s also a sawed-off, scabby-kneed kid who grew in the ringworm belt. She’s gritty, a survivor. She can’t scrub her Texas twang from the page without harm. Yet her truth also includes being wicked smart, obscenely well read, a celebrated English professor, a deeply devout convert to Catholicism. Freeing her inner and past kid from the shadows of those adult attainments involves finding her again. For Karr, as for me, this means first writing like we remember the sentences of smart, hyper-literary folk made us feel. Or of anyone who impressed us at an impressionable stage. But the power and beauty of the voices we recall probably isn’t the same as ours. Thus Karr circles back to her everlasting concern, authenticity. And how to find a suitable prose style for it. She dives through the past’s layers by locating what she calls “carnal” details—sensory impressions, often smells or textures—that bypass thought. The split self or inner conflict must manifest on the first pages and form the book’s thrust or through line—some journey toward the self’s overhaul by book’s end. However random or episodic a book seems, a blazing psychic struggle holds it together . . . The carnage, of course, sparks a natural urge toward moral outrage, a position that demands somebody be blamed. But blame makes deep compassion impossible, and in spiritual terms—which is what Herr grows into by book’s end, when he becomes a Buddhist—only compassion can bring about deep healing. Writing is painful, fun only for beginners or hacks. With rare exceptions, good work comes only from revision. The best revisers read books published before the current age. There are other useful, less ouchy tips scattered amidst her analysis. But Karr has written not so much a how-to book as a companionable guide for kindred souls. Richard, your last sentence here is exactly the summary I’ve been grasping for, “Not so much a how-to book as a companionable guide for kindred spirits.” Amen. Thank you for articulating this so concisely. I just finished reading the book yesterday and have to admit that my eyes glazed over through many of the analytical chapters, but when she got into her own process, she positively shimmered. Thank you, Sharon. It is not an easy book! I tried to distill what struck me, but I agree: it is dense in places with analysis. I think it could be confusing for beginners, and could lose even serious students/practitioners who aren’t paying close attention. Not really nighttime reading? Yet it grew on me, for those nuggets I quoted. Interesting to hear the two of you discussing how analytical the book is. Would be great, I guess, if you were teaching some of the same books she uses in her class and takes apart in this book. I love Mary Karr, but I didn’t rush out to buy this one right away. If I were teaching or writing memoir, I’d consider it required reading. However, this is the year when organizing and tossing memorabilia and traveling are taking up center stage in the “drama” of my life. Thanks, as always, for a perceptive in-depth review, Richard. Thanks, Shirley. Enjoy your fall travel! Hi, Richard. I have to confess that ever since “The Liar’s Club,” I’ve been too intimidated by Mary Karr’s reputation to read anything else of hers. But there is one caveat I would make with her subject matter. Though I believe I have touched base with you before on the fraught question of the difference between autobiography and memoir, I would not class Nabokov’s “Speak, Memory” as a memoir but as an autobiography, granted as full of hot air as a hot air balloon. The difference to me at least in that particular case is that he isn’t very episodic (not in my estimation, anyway), but is historical in focus, making a family history as if he were writing about some aristocratic family well known in international circles (as perhaps they might have actually been in his time). Am I just talking through my hat, or do you get my drift? Thanks, by the way, for your review of Mary Karr’s book. Maybe it’s time I got over my hesitations with her books. Victoria, I liked Lit—a lot. It’s somewhat unusual in tracing a movement toward spiritual practice out of despair. On Nabokov, he has some long, to me boring, ancestral history in Speak, Memory, It really clashes with his stated philosophy and practice in the rest of the book of eschewing completely such obvious facts. For instance, he refuses to write about his own family’s political exile and his father’s murder, preferring the beauty and personal meaning he found in art and butterflies. I had to admire his conviction there, even though only a writer of his stature could get away with it. At least that’s what I thought, and so loved Karr’s analysis for calling him on the inclusion of the tangential family history. She views it as a fault of ego. But aside from that flaw, she loves the book. She does marvel, as I did, at his elliptical treatment of the younger brother he bullied and who died at the hands of the Nazis. I see. Well, it’s been a long time since I read Nabokov’s book, so perhaps I don’t remember it as well as you do, especially considering your special focus on the personal story. But as to his subject matter, I would almost say that in places he is using the rhetorical figure of paralipsis, which as you probably know is the figure of talking about something in the process of saying you aren’t going to talk about it. It doesn’t have to be conscious paralipsis, of course, many writers seem to embark upon it without conscious intent or realization. But in any case, I was reading it at the same time as I was reading “Pale Fire,” and perhaps he was a little too much to take on the combined fronts of personal story and fiction. He was too smart to discount his having a strategy! Maybe it didn’t work for me, but he must’ve known his aims and surely it did work for some. He’s the very definition of genius, of mine anyway: brilliance plus output! To produce the novels he did AND a classic memoir is staggering. Virginia Woolf is another who comes to mind who fits my definition of literary genius. Of course many in the canon fit my label. She’s just my favorite. Reading this exchange of comments, something became crystal clear to me. While I thrill to read exquisitely polished prose, I may be more moved by starkly homespun stories that seem to pour straight from the heart with no artifice. I see beauty in the Geisha face, pancaked white, perfectly painted. I see beauty in tangled hair and sweaty faces crossing a finish line. IMO, Mary Karr is preaching to the Geisha choir. Am I the only one who sensed an undertone disparaging “lesser” efforts? I desperately hope the growing emphasis on all the costly steps involved in producing a “professional” (meaning “worthy”) writing product won’t scare off those with less motivation or money and prevent them from sharing as they are able.Please, let’s do what we can to honor and encourage the efforts of all, however grand, however humble! In the interests of full disclosure, I’ll admit that as both reader and writer, I feel a bit threatened by the growing Geisha rage. I’ll use my coffee mug preference as a metaphor for why. At home, I drink coffee from nothing but mugs hand-thrown with lightly-glazed rough clay. Few things are as sublime as the rich aroma and steam rising from that first cup in the morning and the earthy, true feel of the hefty mug’s irregularities. I love the feel of substance against my lips. But my mug might bruise your lips or jangle your finely tuned finger nerves, so I’m glad you have the porcelain alternative. I take your point, Sharon—and thrill to your metaphor. There may be elitism in play, though Karr would probably call it a meritocracy. In fairness, at least officially she ranks Harry Crews’s memoir beside Nabokov’s. Personally I remain troubled by her “writing is hard” line. It seems at once true that writing actually gets harder even as a writer improves—it is for me—and in some way false because overly reductive, a truism like “life is hard.” I think, in contrast, of Annie Dillard’s helpful and borderline spiritual insight that a writing practice is about love, not discipline. I’ve read of Karr but have not read any of her works yet. I understand her approach to memoir with regard to structure and have read memoirs that utilize such structure and also those that did not, or used a variant of it. Lene Fogelberg’s Beautiful Affliction comes to mind. It is written in alternating chapters, present and past, both using linear time. I am working on the fourth draft of my memoir, which somewhat follows the structure Lene used in her memoir, but the order of the flashbacks are not always chronological. This was not intentional; it is simply how the story unfolded beneath my pen. The prologue, rather than showing the emotional stakes that the memoir would lead to is instead a flashback to when I was a very little girl and experienced my first “loss”. This seems to be important as for setting the tone. Throughout each successive draft this structure has not changed. This tells me that I am, if you will pardon a writer’s ego, on the right course. Makes sense to me, Veronica. Usually there’s been some massive rethinking, but sometimes we do get it right from the start! Good luck . . . Thank you, Richard. Yes, sometimes we do get it right from the start, but that seems to happen to me only in my fiction writing. Lol! Hi Richard! Using this post (attributed!) for my students at UCLA. Great break down. Hope you are well! Best to you. Thanks, Liz! Good to hear from you.